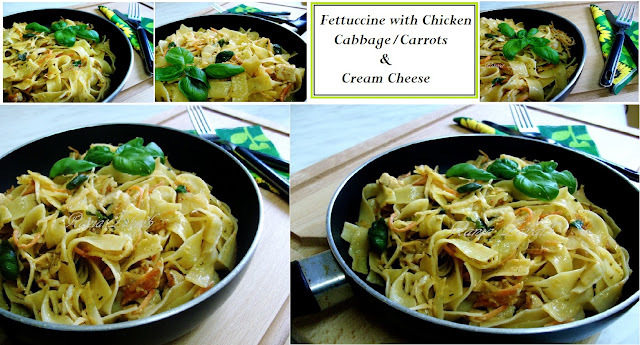 Fettuccine is flat narrow pasta usually made with cheese sauce and butter and lots of parmesan on the top. I always do my own variations according to my wish and taste, so I just added what I thought would be yummy and I made it on a quick track and it turned out outstandingly scrumptious. I can recommend it to all who love pasta and want to make some think which is not time consuming then this is the right one! I used fresh cream cheese in it and made it in herb butter, this is butter where dry herbs like dil, thyme rosemary and chives are already mixed in and at times some garlic too. This gives a very nice creamy taste. I have used the normal no brand cheese, you can take Exquisa or any equivalent, it is perfect. Pasta, here I must mention that I broke the narrow strips in two and three as I like it in short form :) So…. then I had some chicken pieces which I had made for tikka, had my cabbage and carrots cut for salad so I used that and of course my fresh basil leaves a must! While the pasta was ready, I melted a small cube of herb butter in the pan, added the chicken cubes and fried till the pieces were done, then added the cabbage and the carrots and twisted and tossed till it gave a bit fried look. Mixed in 3 table spoon of fresh cream and let it melt and mix well, sprinkled few drops of Tabasco, by the time it was quite creamy. I just sprinkled some black pepper from the mill, dint need any salt as the butter was salty. I saved the extra Cals of the parmesan cheese as i had already added cream cheese, just mixed in some basil leaves and some for the top, they give such a nice aroma and are such a must for pasta, I simply love it and my kitchen basil plant is growing so nicely, I am full smiles looking at it daily. Now because I have written the whole process of what I did, I will mention the ingredients below so you have a slight idea of things. I made around 2 small plates so if you are making more, then double or triple the ingredients to get the best result. 4- never over boil too soft, always take off as they are a bit firm to bite, those taste wonderful!